“As the door turneth upon his hinges, so doth the slothful upon his bed.” (KJV). “As a door turns back and forth on its hinges, so the lazy person turns over in bed.” (NLT). It’s amazing today how so many in today’s culture celebrate the idea of being lazy. Today’s generation of young people with their “oh well, whatever, never-mind” dysfunction is everywhere you look. They say that there is nothing new under the sun, and it’s true. Laziness was a problem with human beings when King Solomon wrote these Proverbs nearly three thousand years ago. In today’s Proverb, Solomon says that a lazy person turns over in his bed the same was a door turns on its hinges. There is a lesson in this! It doesn’t matter how many times the door opens or closes, it never goes anywhere. Ten years from now, it will still be in the same doorway. In the same way, a lazy person will never get anywhere in life. It shocks me the number of young people today who have no work ethic, and no motivation or desire to do anything with their lives. I know of young people who get a job but it doesn’t last because a few days or weeks into the job they don’t feel like working, so they just don’t show up to work so they get fired, or they eventually quit. I know of a man who goes from job to job, quitting one and being fired from another, and the saddest part of this story is that his son is following in his footsteps as well. 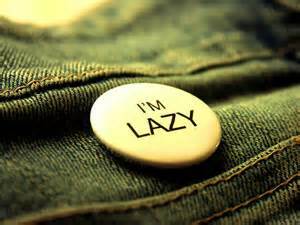 Not only are people naturally lazy – averse or disinclined to work, activity, or exertion – but they are also spiritually lazy as well. There is no hunger or thirst for more of God in their lives, no passion or desire to seek the Lord in prayer or Bible reading, and no motivation to excel in living lives of purity and holiness. People come to church content to sing songs and hear stories about what God did in the past, with no expectation of encountering that same God today. What will become of us as a people if we don’t change? The Challenge: Wake Up and Work Hard! The Bible gives us this challenge: “And where your light shines, it will expose their evil deeds. This is why it is said, “Awake, O sleeper, rise up from the dead, and Christ will give you light.” So be careful how you live, not as fools but as those who are wise. Make the most of every opportunity for doing good in these evil days.” (Eph. 5:14-16, NLT). God has called every one of us to make a difference in the world for good. Edmund Burke said, “All that is necessary for evil to prosper is that enough good men do nothing.” Let us be done with laziness in all of its forms – be it physical or spiritual laziness – and let us arise and let our lights shine in our world, that men may see our good works and glorify our Father in Heaven! This entry was posted on Tuesday, October 8th, 2013 at 12:00 am	and tagged with Bible, Book of Proverbs, God, Hard work, Laziness, Lazy, proverbs, Religion and Spirituality, Wisdom and posted in Warnings. You can follow any responses to this entry through the RSS 2.0 feed.